Using vinyl, tape loops and a decrepit sampler, composer Phi Bui’s music draws from the traditions of turntablism, jazz and instrumental hip hop. 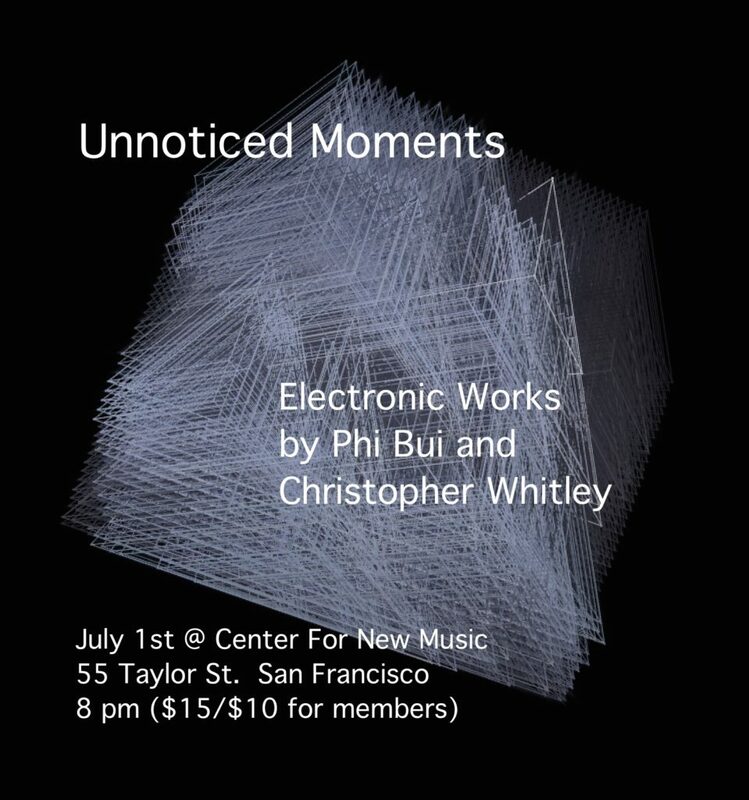 Electronic music at its most organic, Bui’s music can be heard on his new album Unnoticed Moments, recently released on Eilean Records. Christopher Whitley’s electronic music explores the space between instrumental timbre and computer-generated noise. Violin, piano and the human voice serve as the basis of his compositional work. Whitley will perform a set of new pieces with live visuals. PHI BUI is a composer and producer residing in San Francisco, CA. Born and raised in the Bay Area, he began piano and percussion studies at a young age, receiving scholarship and awards from the Percussive Arts Society International Convention and Avedis Zildjian. Phi has attended the Nancy Zeltsman Marimba Festival where he studied and participated in masterclasses with Fumito Nunoya and Nancy Zeltsman. Compositions range from works written for full orchestra to electro-acoustic pieces for monochord and sampler. His natural influences stem from early exposure to noise rock, lo-fi, jazz, and his father’s classical guitar. Canadian violinist CHRISTOPHER WHITLEY is an engaging and versatile performer. From Baroque music to free jazz Christopher is committed to exploring and performing music of all styles. He is a dedicated chamber musician and collaborates regularly with young composers in both the Bay Area and Canada. He is a founding member of the Thalea String Quartet, the first quartet-in-residence at the San Francisco Conservatory of Music. Christopher has performed at a number of music festivals including the Toronto Summer Music Festival and the Domaine Forget Chamber Music Academy. He has performed on period instruments at the Boston Early Music Festival and the Valley of the Moon Music Festival and appeared at the 2009 CMJ Music Marathon in New York, performing original compositions for violin, cello and electronics.